In the Sherlock episode “His Last Vow,” we catch a glimpse of the inside of Sherlock’s mind palace right after he’s shot. 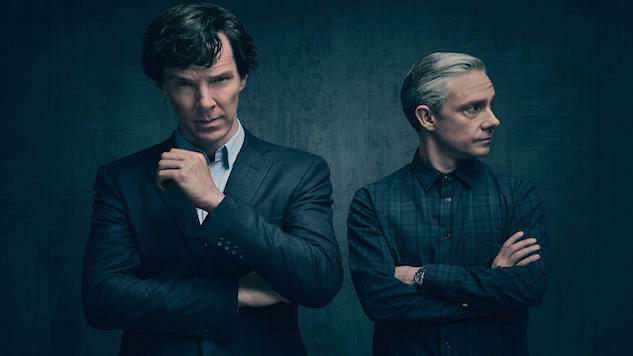 Within a slowed-down three seconds, Sherlock pictures various rooms from his memory, flashing through a sterile white hospital-like room, his brother’s office, and a cylindrical prison with his archenemy Jim Moriarty. He falls backwards—but manages to maintain consciousness to stay alive. Sherlock builds mind palaces to store his memories and keen observations. The mind palace isn’t fiction, though. Top memory champions like the current world champion Alex Mullen and neuroscientist Boris Nikolai Konrad construct mind palaces of their own to remember vast amounts of information. “By making visual images and making associations with information, you can store information that wasn’t there before,” Konrad says. In a recent study published last month in Neuron, Konrad collaborated with other researchers to study how mnemonic training reshapes brain networks. The team asked naive subjects who had never underwent mnemonic, or memory-improving, training to train in the method of loci for six weeks. The method of loci actually dates back to the 80s BCE, in ancient Rome and Greece. The book Rhetorica ad Herennium, which is about rhetoric and persuasion, describes this mnemonic technique. In this method, one mentally creates a “mind palace,” which could be a room or a house or a landmark for storing images associated with words or numbers. At the end of training, the team scanned the subjects’ brains, and they found the subjects’ brain connectivity became more similar to that of memory champions. In particular, the regions associated with strategic memory coding and applying existing knowledge to new situations showed stronger connections. The method of loci works because our brains evolved to remember visual and spatial information, says lead author Martin Dresler, assistant professor of cognitive neuroscience at Radboud University in the Netherlands. Konrad started learning the method of loci in high school. Besides acing his tests, he eventually started participating in memory contests. When storing information, he associates that information with a concrete image and imagines it in various locations around his mind palace. If that sounds a bit complicated, Konrad describes his process for remembering something. He’s prepared 60 to 70 mind palaces, building from familiar locations and cities. When memorizing a string of numbers, Konrad will take an hour to set up his mind palace and group the numbers in pairs. He associates each pair with an image, based on the mnemonic major system, which converts numbers into consonant sounds. For example, if he’s remembering 1224, according to the system, 1 is the D sound, 2 is the N sound, and 4 is the R sound. Konrad pictures a hotel he stayed at in Times Square. To remember the first two numbers, 12, he pictures a dinosaur, because of the letters D and N. In his mind palace, he places the dinosaur in the hotel room’s bathtub. To remember 24, he pictures Nero, because of the letters N and R. He imagines Nero in the bathroom sink. When retrieving this information, he’ll mentally enter his mind palace, and journey through the hotel room, translating the images back into numbers. Ericsson, who recently analyzed the techniques of memory champions, argues that mnemonic strategies work for remembering less meaningful information, such as strings of numbers. But if you want to become an expert at a skill, mnemonics isn’t the way to learn it. Instead, to learn a skill, one should understand the meaning of what’s learned and how the information can be applied. However, mnemonic techniques can still be used in everyday life. In his daily life, Konrad uses only up to five mind palaces, such as his home, the university where he works and his parents’ house. He remembers names by associating a face with an image. If one gives a presentation or wants to remember names, the method of loci can help keep facts and names straight. 1. Think of a location to build your mind palace. It’s easier to build off of familiar places, such as your home, your school or your workplace. 2. Construct a sequence of landmarks in that mind palace. For example, if your mind palace is your home, think of a specific sequence of objects you see as you walk through your home: couch, coffee table, and so forth. Find a way to translate words or numbers into images. You can use the mnemonic major system to create images out of numbers. For words, think of an object that the word sounds like. For example, if you’re trying to remember the city Moscow, you might picture moss and a cow. For names, think of an object the name sounds like, and picture the face of the person interacting with that object. 4. Place these objects in the sequence of landmarks in your mind palace. For example, if you follow the mnemonic major system and are trying to remember 1234, using your home as a mind palace, you might picture a dinosaur sitting on a couch, and then a mirror suspended above the coffee table. 5. Spend some time getting acquainted with the objects you placed in your mind palace. Imagine walking through your mind palace, and then seeing these images throughout the rooms. 6. When it’s time to retrieve information, journey through your mind palace and follow the landmarks. Translate the images back into numbers, words or names. 7. You improve with practice, so if you want to dramatically improve your memory techniques, spend time each day doing memory exercises. You can memorize strings of numbers, a list of words or use this method to study for tests. You can even build multiple mind palaces if you need to store more information. If you need to memorize multiple sets of information within the same day or two, use separate mind palaces so you don’t retrieve conflicting information. Rosalie Chan is a writer originally from the Chicago area, and her work has appeared in publications like TIME, Inverse, Narratively, and more.